Spirit Of Triathlon Photo Contest – What’s Next? At the deadline on Thursday, we had 105 photos entered which have all showed the Spirit of Triathlon! Ranging from youth to pro photos, and race directors to challenged athletes, I am really thrilled with the response and especially the quality of the photos! Now my job is to pick the top 20 for the Triathlete.com gallery and from there to pick the top three! Over the next two weeks, I will be going through the images and on or about March 7th, an article commenting on the top photos and the full gallery of the top 20 will be posted. I will also post a blog discussing all of the top 20 images. In the meantime, I am off to the Abu Dhabi International Triathlon and I will see you at the races! Follow me on Twitter @CompImagePhoto as our Photo Of The Day begins the 2013 race season! 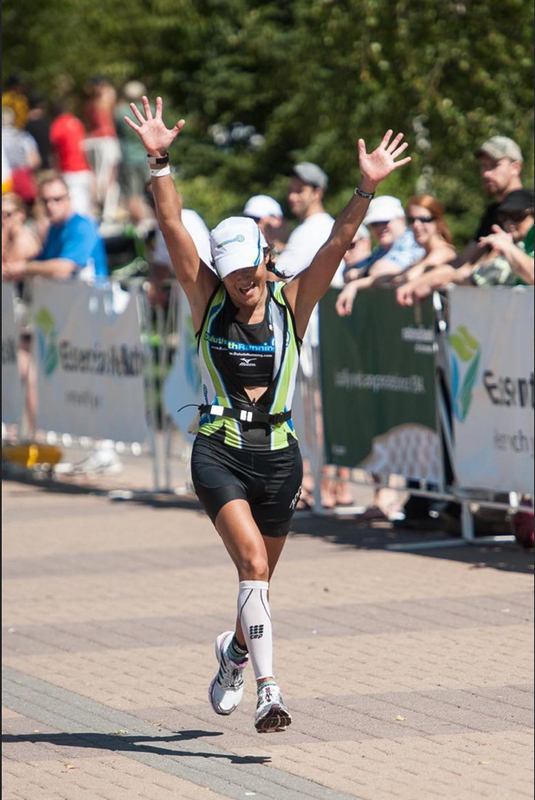 This is the fifth and final review blog for our 2013 Spirit of Triathlon Photo Contest. As of this time we have 100 entries and I am pleased that we will have a great 20-image gallery for Triathlete.com to post. Entries can be submitted until midnight Thursday, February 21. This week I want to show a shot that has been submitted and how with a bit of cropping it can be really improved. One of the things that I often speak about in my photo class is that we want to show the viewer of the photo something that is different than what can be seen by the spectator. Sometimes this is a high angle or low angle shot, both of which I am fond of; and sometimes this can be as simple as how you crop the image. This first image was submitted by Jason Falk, and well it captures a critical moment on the run at Kona, with French Pro Cyril Viennot cramping up and kneeling near him French Photographer, Thierry Sourbier. Theirry is a good friend and carries even more gear than I do. The issue with this shot is that a special moment is trapped within a lot of visual noise. Now with some simple cropping we have dramatically increased both the intimacy and intensity of the image. This shot could have been even better if it has been shot at a low angle. The next image is by Matt Moses. I am so pleased that Matt included a few of his images in our Spirit of Triathlon Contest. Matt is a good friend who lives in Northern Minnesota and while by day he is a software guy, he is a really fine photographer! I know Matt and I know that he shoots in bursts and as such is able to pick out the individual frame where the bio mechanics are the best and in this case, at the peak of the athlete’s celebration! 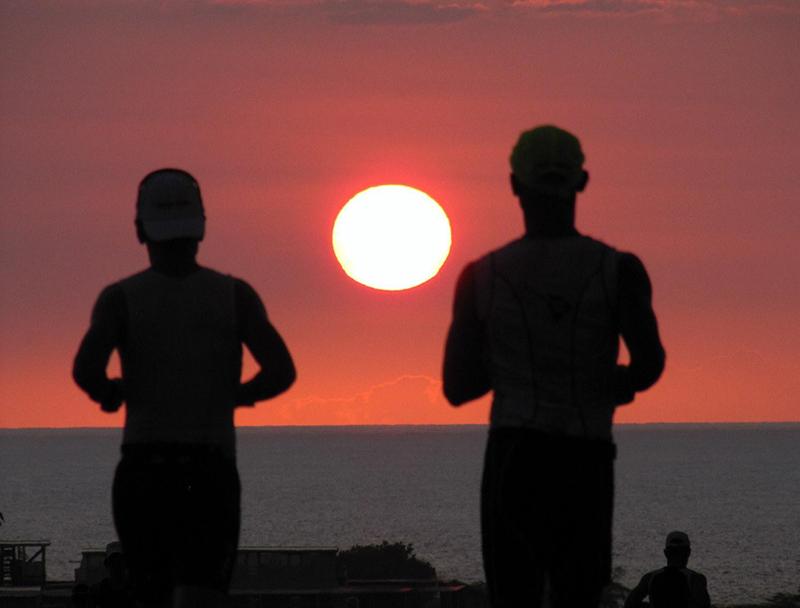 Finally, here is a shot by Lee Gruenfeld, sunset on the run at Kona – always a good parting shot! Although the contest is ending on Thursday night, we are still finalizing the timing of when the images will be published on Triathlete.com. I head off to the Abu Dhabi International Triathlon on Sunday and will be reviewing images while I am gone. Thank you all for participating in our first Spirit Of Triathlon Photo Contest. I hope our next one is bigger and better! I admit it, I am more than a little bit behind on this post. However, in my spare time I did shoot three Alpine Ski Races and one Nordic race. From the Nordic race, I flew to San Diego to both thaw out and to attend the Third Annual Triathlon Business International Conference. In my four days of races, I shot, edited approximately 15,000 images. I know it sounds crazy, but you can do this too. Check out my Work Flow Blog Post. In the Spirit of Triathlon, I am often asked by people outside of the sport why do I shoot triathlon, I think this photo says it all. Here are the full contest details. Also, I have extended the contest deadline from February 19 to February 21st, so I can do one more review blog! I am again really pleased with both the number and the quality of the images that have been submitted. We have received images of challenged athletes, kids, age group athletes, and volunteers. We have also received a number of great shots of pros. This week I have selected images of 3 pros to discuss. It is always a challenge to get sufficient access to get a good angle for a shot of the pros (as well as any other athlete). As I mentioned in my initial post of about the contest, it is open to all non-professional photographers. There are hundreds of bloggers doing a great job covering our sport while maintaining a family life, full-time job and training for races! Depending on the blogger, indeed they sometimes can gain better access than some others, but that isn’t necessarily the deciding factor on getting a great shot. This first shot is of Matt Russell at 2012 IM Arizona and is by Jason Falk. I happened to meet Jason at the event and I know he did not have any special access. I like this shot because of the low angle and although Matt is racing hard, he had time to reach out to a young fan. Mirinda Carfrae is one of the toughest athletes I know, having battled herself into a podium spot finishing third at Kona and then collapsing. Since I was sitting on the floor of the finish line that time and also had a shot of Rinny, I know that Charlie Abrahmas must have been in the photo stands behind me. You can see my shot of Rinny in my Suffer Gallery on my website. My image was also featured in Triathlete Magazine’s Kona coverage. The final image for today’s review is of 4-time Olympian Hunter Kemper at the 2012 HyVee 5150 Championship by Terry Van Oort. Hunter ran himself into 2nd place and a great payday. Keep sending images – one more week until the contest ends!